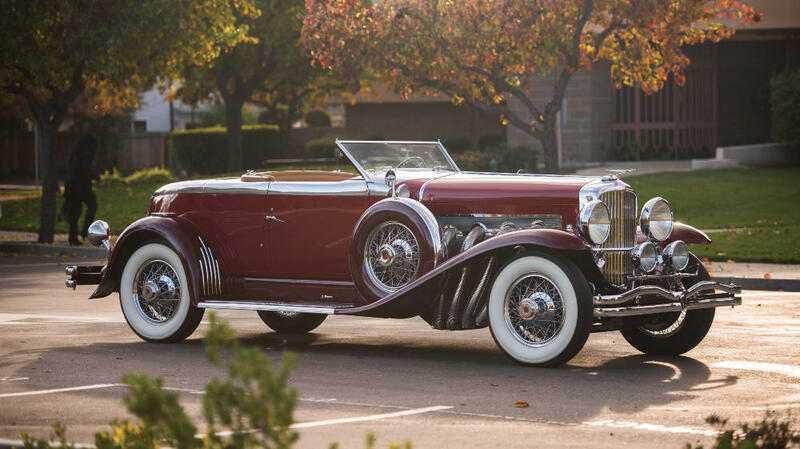 Two Duesenberg Model J cars and three Cobras are amongst the top American cars on offer at the 2016 RM Sotheby’s classic car auction in Phoenix, Arizona. A 1929 Duesenberg Model J Disappearing Top Torpedo Convertible Coupe by Murphy (est. $3,000,000 – 3,500,000) and a 1965 Shelby 427 Competition Cobra, chassis CSX3010, (est. $2,500,000 – 3,300,000) are amongst the highlights expected of the auction. The 1929 Duesenberg Model J Disappearing Top Torpedo Convertible Coupe by Murphy (est. $3,000,000 – 3,500,000) is one of only six built and has many unique features including the one-off tail design. The car has its original body, firewall and chassis. It has covered only 17,000 miles since new. The Duesenberg originally belonged to the Gray family, who invested $10,500 in Ford in 1903 and sold the shares back to Ford in 1919 for $26 million. Only a magnificent 1937 Mercedes Benz 540 K Special Roadster by Sindelfingen (est. $10,000,000 – 13,000,000) is expected to sell for more at the auction. The 1934 Duesenberg Model J Town Car by Murphy (est. $1,200,000 – 1,400,000) is one of probably six Murphy Town Cars built on the Model J chassis. The car has its original chassis, engine, firewall and body. The car originally belonged to Philadelphia socialite Ethel M Dorrance, who “retired” the car with 1,800 miles on the clock after a brick was thrown at it by a political agitator. The car is believed to have covered less than 40,000 miles since. The 1965 Shelby 427 Competition Cobra, chassis CSX3010, (est. $2,500,000 – 3,300,000), is one of only 23 Competition Cobra 427s built and the only one to have won championships in two countries. It won the 1968 US SCCA A Production Championship driven by Peter Consiglio and the 1971 Eastern Canadian Endurance Championship driven by John Risley and David Fram. In the 1968 season, it had podium finishes in 8 of 11 SCCA races. The 1963 Shelby 289 Cobra “Dragonsnake”, chassic CSX 2093, (est. $1,400,000 – 1,600,000) is one of only three Cobras independently prepared to “Dragonsnake” specification. It was raced by Bruce Larson for owner Jim Costilow and is “the winningest Dragonsnake” and most successful drag-racing Cobra. The car is fully restored and considered to be remarkably original for a racing Cobra. The 1964 Shelby 289 Cobra (est. $950,000 – 1,100,000) was originally a company demonstration model and one of fewer than 20 fitted with C4 automatic transmission. The car was never in a major accident and rains most of it original components. It is finished in the original colors of white over red. The 1953 Cadillac Series 62 Coupe by Ghia (est. $1,500,000 – 1,800,000) is one of only two examples built by Italian coachbuilder Ghia on a typical American chassis. Remarkably, very little is known of the period history of the car that looks more Alfa Romeo than Cadillac. The 1911 Lozier Model 51 Seven-Passenger Touring (est. $900,000 – 1,100,000) counts the Henry Ford Museum and Ken Pearson collection amongst its only four previous owners. This highly original car is well maintained and a veteran of 77 tours between 1970 and 1988. Bonhams hopes to achieve a similar result with a 1912 Roll Royce 40/50 HP Silver Ghost Roi-des-Belges (est. $800,000 – 1,000,000). The 1952 Cunningham C3 Coupe by Vignale (est. 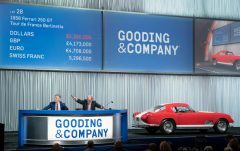 $900,000 – 1,100,000) is one of only 19 Cunningham C3 Coupes and one of only three with bodywork by Vignale. It is also the only one with Vignale coachwork to have been raced in period.